We are highly pleased with archivist Kathy Kauhl’s work. She has organized 80 years of material as well as anyone at the Library of Congress could have done. You think the way an engineer thinks and I appreciate that. Moretrench is one of America’s premier environmental and geotechnical contractors. In anticipation of the company’s 80th anniversary, we archived its materials. This involved sorting through tens of thousands of photos, slides, project documents, blueprints, advertisements, and other materials, some in precarious shape. We preserved all the key items in archival-quality containers. They’re now catalogued and stored in a small, climate-controlled room (about 5 feet by 10 feet) within the company’s headquarters. Moretrench has scanned many of the photos, making them available digitally to employees and vendors. Moretrench project histories are now archived. 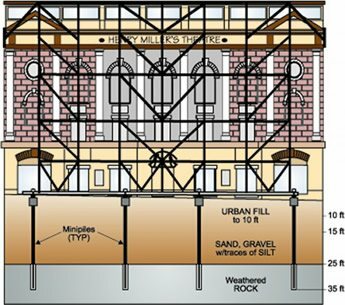 This schematic illustrates the design/build installation of a rock-socketed foundation system at Henry Miller’s Theatre in New York City (subsequently renamed The Stephen Sondheim Theater). The system supported an essentially free-standing scaffolding erected to preserve the landmarked theater façade while the rest of the building was demolished and a new skyscraper built.